Nevill Avenue under construction in 1933? The houses in the distance in the 1933 photo above. The present-day photo, taken on 18 February 2018. By 12 February 2018, and unable to keep this mystery out of my mind, I was thinking this photo might have been taken in the area between New Church Road and Portland Road, but the only suitable semis on Streetview were on the north side of Lawrence Road, and even they seemed to be in the wrong position. A breakthrough came on 16 February, when I was driving up to play golf at the Dyke, and noticed that the trees on the north side of the Devil’s Dyke Road had been bent by the west-south-westerly wind in the same way as those in the old photo. This meant that the original photographer had been looking northwards, so Nevill Avenue was definitely out, as it runs from east to west. I went down to Lawrence Road and found Nos 61 and 63, which stand at the western end of the road, next to Hogarth Road. They met all the criteria of the houses in the photo except the side chimneys, but a tell-tale patching of tiles on the side roof of No 63 showed that a side chimney had probably been removed. 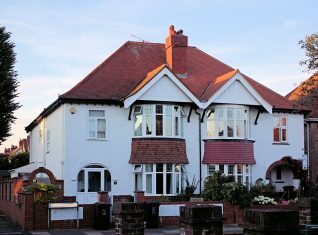 Some of the adjacent matching houses still have theirs. I had another problem though because, even standing at the most southerly point in Hogarth Road, close to the junction with New Church Road, the pair of semis in Lawrence Road looked far too close when compared to the originals. I decided to cross New Church Road and walk towards the seafront. 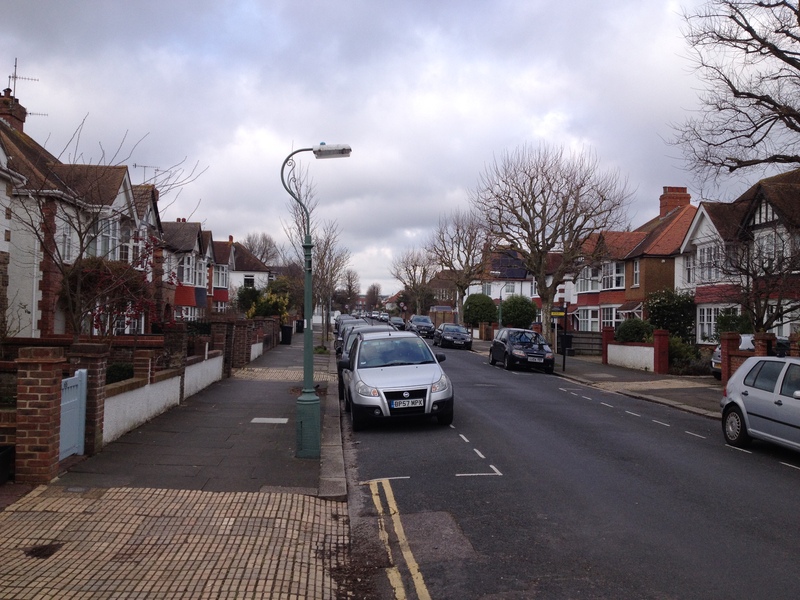 It then dawned on me that the line of New Church Road was actually running across the old photo from left to right. 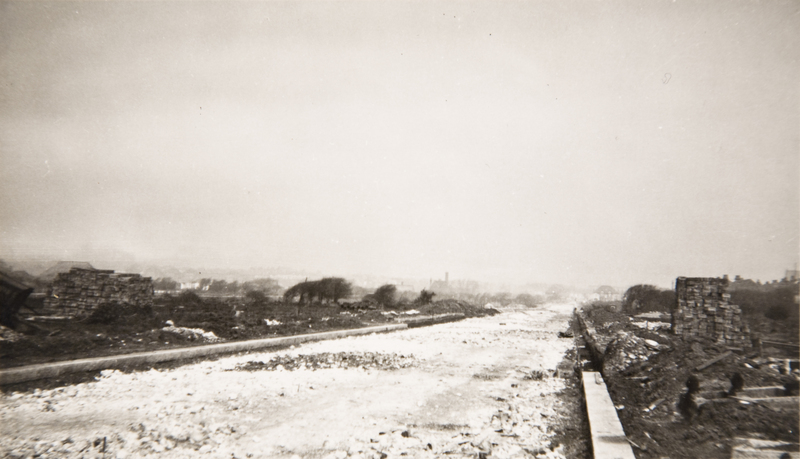 This meant that the photographer must have been looking north up the line of Braemore Road under construction, with a view across what is now New Church Road and onwards up the line of the present-day Hogarth Road, with Nos 61 and 63 Lawrence Road in the distance on the right. A final piece of clinching evidence was the roof of St Philip’s Church, New Church Road, the western end of which can be seen on the right-hand skyline at the edge of the 1933 photo. I took the present-day photo from Braemore Road on 18 February 2018, slightly to the left of the original position in order to avoid the trees, and bring the white-painted 63 Lawrence Road house into the shot in the distance, behind the 30mph speed limit sign. The piles of bricks on both sides of Braemore Road under construction in the old photo have, for over eighty years, been incorporated into the houses in that road, but I have no idea which ones! Eighty five years after it was taken, the mystery has been solved. It is just a shame that Mr Gray is no longer with us to share the discovery of the true location, the east kerb line of Braemore Road, Hove, looking northwards during its construction in 1933. Nice bit of detective work Alan. Well done. I really needed to take a bit of my own advice when telling people about navigation tricks especially for the South of England and how the trees generally lean to the North East. I totally overlooked that and was concentrating on the buildings and curve of the road. I think the schools construction was started sometime around 1933/4. Another navigation tip for the northern hemisphere you may already know, conifers eg. Leylandiis etc. usually have drying brown foliage to the north due to lack of sunlight. Thanks Tim and Bob, and for the extra information Bob. Regards, Alan.